Train services on the East Coast Main Line would no longer go to Glasgow and instead terminate at Edinburgh, under new plans which have emerged. At present, the service leaves Kings Cross and travels up the east coast of England before carrying on to Edinburgh, then Glasgow. The new December 2010 timetable is currently under discussion. The Department of Transport said it would have to go to public consultation for the changes to take place. Rail watchdog Passenger Focus said the group was seeking reassurances about the line's future. Scottish director James King told BBC Scotland: "At the present time the Department for Transport is consulting on a new timetable for the East Coast route, which will generate more train paths and faster, more consistent journey times between Edinburgh and London. "As a consequence of that, it is proposed in the timetable that the services that are presently provided between Yorkshire and Glasgow by the East Coast operator are moved to another operator. "We're looking for reassurance that another operator will be found. They're certainly shown on the timetable as not being operated by the East Coast operator. "Clearly, there are other operators out there who could pick up the services - potentially TransPennine or Arriva Cross Country. But a deal would have to be done with those operators because it would be a variation of their franchise." Direct services from Glasgow to London Euston will continue. However, Mr King said a "significant" number of passengers travelling from the north east of England to Glasgow through Edinburgh would be affected, particularly in the mornings going north and evenings going south. He said there would be a particular impact on key routes to destinations such as Newcastle, York and Doncaster. "There is a significant flow from the north east of England through to Edinburgh and Glasgow, which would have to be provided by another operator," he said. He added: "I'm sure negotiations are actively taking place but we are looking for reassurance that this is taking place." A spokeswoman for the Department of Transport said: "Any changes to train services are a matter for the train operating company. "Any such changes could only be implemented after public consultation and approval from the department." 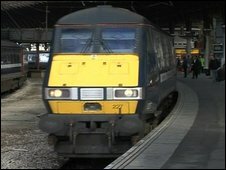 The East Coast Main Line is due to transfer to a government-controlled company, East Coast, at one minute before midnight on 13 November. However, the new timetable changes are not directly linked to the temporary nationalisation.